Did you see the massive IMAGE COMICS sale? Because I sure did! And… I made have gone a little cray-cray. They are creator owned. In other words, the money flow is more direct and the rights stay with the creators. You get a DRM-free file!! Image even puts a “save to dropbox” button right by your comic book after you’ve bought it! Just, wow… I wish every publisher did that! If you buy straight from their website, you can avoid comixology (aka Amazon!). Huzzah!! No idea how much I’m going to enjoy these, though they all have great reviews and great creators. Oh, but I have read the first issue of PAPER GIRLS and OMG. It is SO GOOD you guuuuuuuys! DON’T WAIT FOR THE TRADE – GET IT NOW! Anyhow: great books, Image Comics! 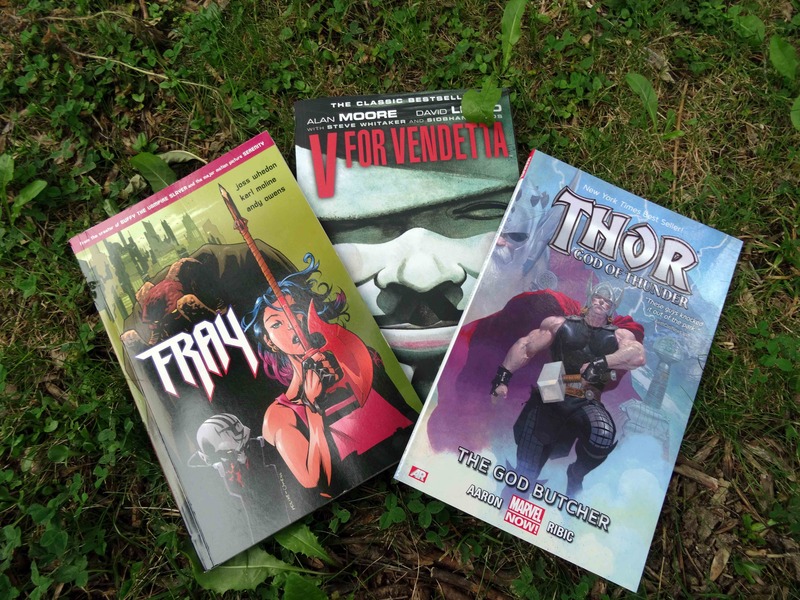 Getting ready for the Readathon… the Comic Book edition! That’s right – once again, Dewey’s Readathon is coming up! In fact, it starts tomorrow – so sign up and clear your schedule quick, as there is still time to participate! Anyhow, since this is my fifth (or sixth?) Readathon, I wanted to do something a little bit different. Which, given my new obsession with graphic novels, obviously meant… doing a Comic Book Readathon! The above are but a small selection of the books I have, but I thought they’d be a good place to start. And, since I am a Marvel Unlimited subscriber, I think I may delve into some more of the Daredevil run by Brian Michael Bendis. I am about 6 graphic novels through the run and it is getting really dark (totally loving it, of course!). As my interest in comic books continues to grow, I’ve come across a LOT of comic books I’ve absolutely adored. My average goodreads rating has jumped rather suddenly purely because I’m reading and loving so many comic books! I think that is just one of the brilliant things about finding a new genre: you start with reading the best-of-the-best, rather than having to dig through a genre you know for a new gem. Everyone and their mother is reading Ms. Marvel (mine included). Let me just say: there’s a very, very good reason for that. This is a modern, fresh take on the typical superhero – perfect for the twenty-first generation. Yes, Ms. Marvel is Muslim, but more than that, she is Generation Z. The girl writes fanfiction, deals with parents who just don’t “get” her modern ways and – most of all – she isn’t even remotely confined by her gender. Ms. Marvel is a fun, fun, fun read. The first volume is out in October and is a MUST BUY for comic fans and non-comic fans alike. Highly recommended. OMG this STORY. I went into this book based off a youtube review of the series (see my post about that here) and was expecting great things. Well… it didn’t disappoint. The artwork is just so stunningly beautiful – rich, warm, soft, but depicting really tough stuff. And the story? Simply perfect. I am not a Movie!Thor fan, but after reading this storyline I can completely see the appeal. The book makes you question the role of faith in society – both the positive and the extremely negative – as well as the “purpose” a God can serve. Absolute genius. Highly recommended. If there is one series a YA novel fan should read, I’d say it is Brian K. Vaughn’s Runways. It follows a group of teens who find out their loving parents are actually supervillians trying to destroy the world. Talk about problems! Not only is the story unique, it also features some brilliant teenage drama to keep you engaged and flicking the pages. First released in 2004, it has been reissued this year by Marvel in a single volume for your convenience! Highly, highly recommended.